(Nanowerk News) What researchers had thought of as a barrier to developing advanced technologies based on the emerging field of plasmonics is now seen as a potential pathway to practical applications in areas from cancer therapy to nanomanufacturing. Plasmonic materials contain features, patterns or elements that enable unprecedented control of light by harnessing clouds of electrons called surface plasmons. It could allow the miniaturization of optical technologies, bringing advances such as nano-resolution imaging and computer chips that process and transmit data using light instead of electrons, representing a potential leap in performance. However, the development of advanced optical technologies using plasmonics has been hampered because components under development cause too much light to be lost and converted into heat. 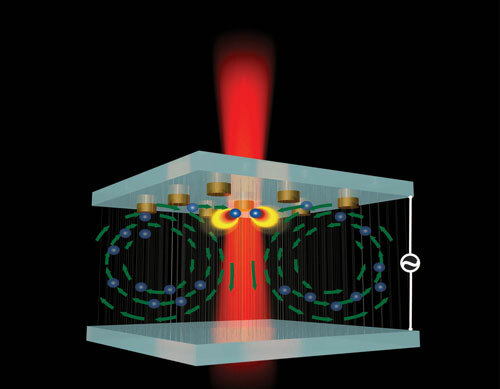 But now researchers are finding that this "loss-induced plasmonic heating" could be key to development of various advanced technologies, said Vladimir M. Shalaev, co-director of the new Purdue Quantum Center, scientific director of nanophotonics at the Birck Nanotechnology Center in the university's Discovery Park and a distinguished professor of electrical and computer engineering. The potential for practical applications using loss-induced plasmonic heating is discussed in a commentary that appeared on Jan. 22 in the Perspectives section of Science ("Plasmonics—turning loss into gain"). The article was written by doctoral student Justus Ndukaife, Shalaev and Alexandra Boltasseva, an associate professor of electrical and computer engineering. "Plasmonics has generated significant interest because of the ability to squeeze light into nanoscale volumes in micro- and nano-devices, but progress has been hindered because of plasmonic losses," Ndukaife said. "We are saying we can use these losses to our advantage." A "nanotweezer" capable of positioning tiny objects quickly and accurately and freezing them in place, which could enable improved nanoscale sensing methods and aid research to manufacture advanced technologies such as quantum computers and ultra-high-resolution displays. A new magnetic storage technology called heat-assisted magnetic recording (HAMR), where nanoantennas, or near-field transducers, are used to focus light onto the magnetic medium. Nanoantennas could be leveraged in HAMR-based data storage. Moreover, plasmonic nanoparticles can be reshaped by heating and used to record images. Quadrapeutics, a clinical therapeutic approach using nanoparticles for cancer treatment. The nanoparticles are illuminated with laser light, producing plasmonic nanobubbles that can kill cancer cells. And a renewable energy concept that uses "plasmonic resonators" to improve the efficiency of solar cells. "Harnessing the intrinsic loss in plasmonics could help to usher in transformative technological innovations affecting several fields, including information technology, life sciences and clean energy," Boltasseva said. "It is time for the plasmonic community to turn loss into gain."